I found myself eating Chinese food in Bridgeport a lot over the past year. 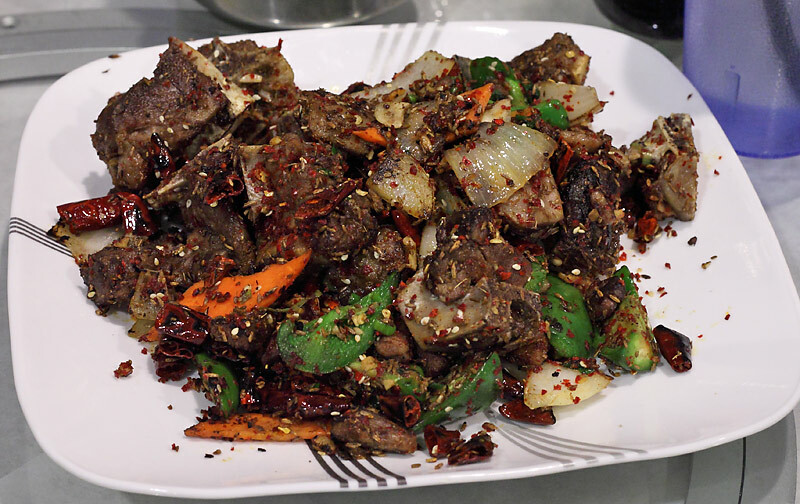 While Chinatown offers a wide range of choices, the cuisine of Northeastern China or Dongbei is better represented between 31st and 32nd on South Halsted. Homestyle Taste quickly became a favorite spot for us both because of the welcoming service and the excellent renditions of Dongbei dishes their kitchen consistently puts out. Bridgeport may not be very convenient for us, but the unique and delicious Dongbei food has made it a regular spot in our rotation. Every meal at Homestyle Taste begins for us with a couple cold appetizers. The kitchen has a deft hand with these simple preparations balancing the ingredients perfectly. 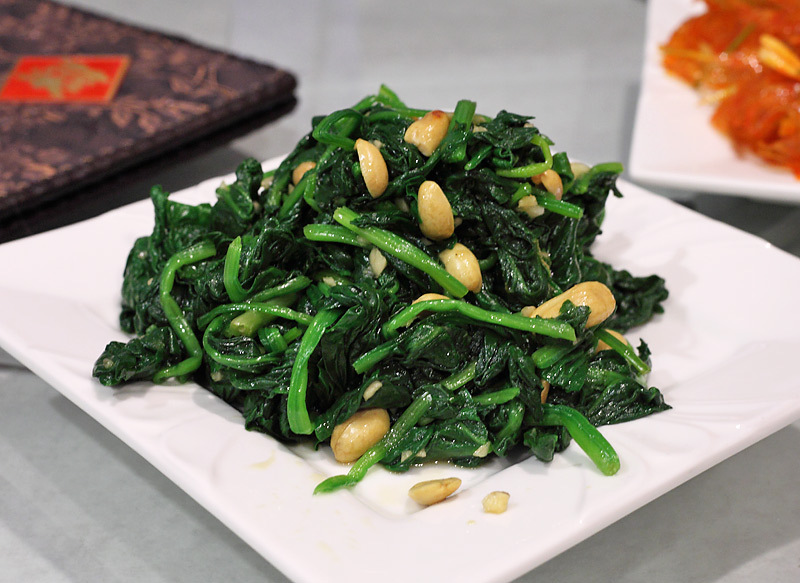 Something simple like spinach with vinegar and peanut hits the spot every time we visit. Similarly, the tofu with scallions and thousand year eggs is a must order. They masterfully balance the textures and flavors so the whole is greater than the sum of its parts. 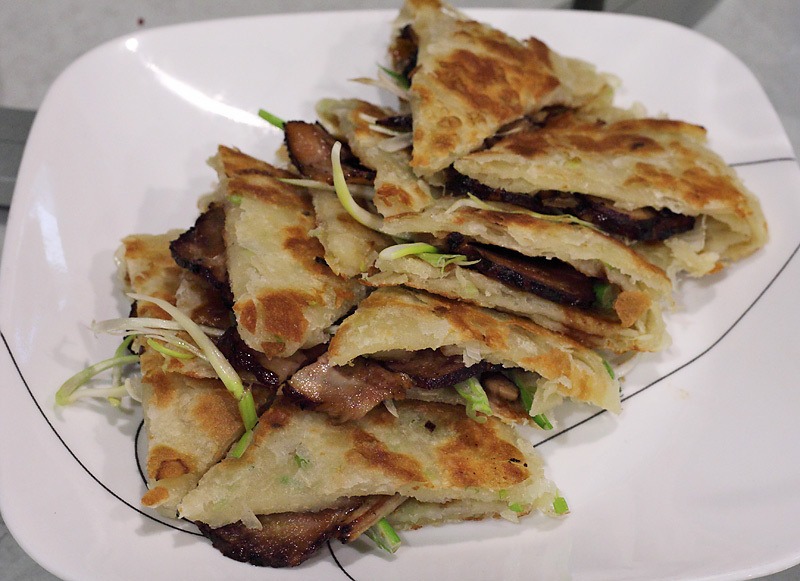 Dongbei is a wheat growing region in China so they offer a variety of dumplings and pancakes. The smoked pork roll is our favorite combining the umami smoked pork, sweetness from a hoisin-like sauce, and a crispy pancake on the outside accented by shaved scallions. JoelF nominated this for "Sandwich I most want to eat this year" and I'd say that's a great choice. Their dry chili preparations are fantastic as well. The bone-in cumin lamb is fatty and lamby and spicy in just the right ways. Also (sadly I don't have a picture), the spicy beef jerky (called spicy hand-tear beef jerk on the menu) is explosively flavorful. TKent said "This dish deserves to be up there on the Chinatown first team all-stars" and I couldn't agree more. Lastly, it wouldn't be a Dongbei meal without one of the iron pot stews. The one pictured is the pork with pickled cabbage. 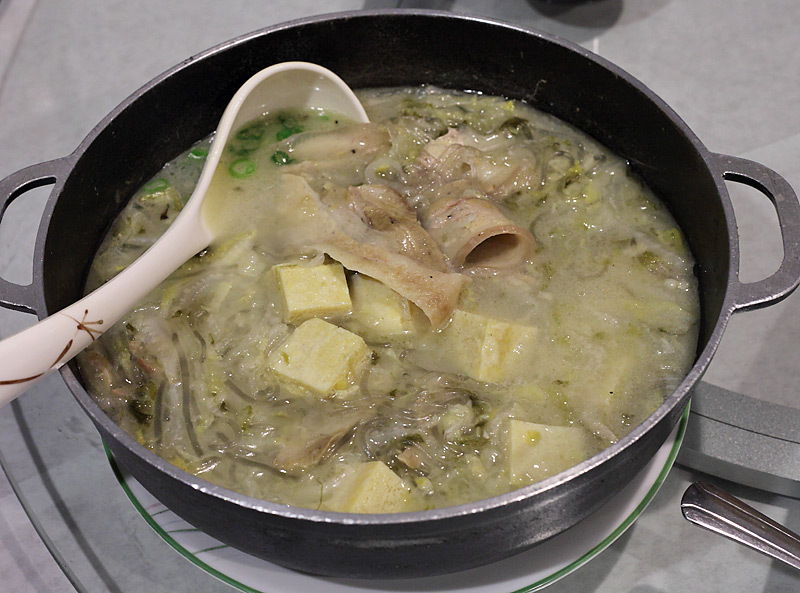 I've only had it once, but the lamb bone and winter melon iron pot is essentially a bone marrow stew and it's spectacular. The iron pots are the ideal cold weather remedy. And I have to touch on the service. The owners are very warm and proud of their region's cuisine. They offer recommendations enthusiastically and never seem to think to mute the flavors out of fear that we won't like it. Dongbei cuisine is bold and hearty, and Homestyle Taste has never shied away from that, which is why we've grown to love them. millerra06: "Jiachang Liangcai (家常凉菜) from the Cold Appetizer section. I forget how it was labeled in English, but literally translates to Homestyle Cold Vegetable. It is listed right under Colorful Wide Noodle (da la pi 大拉皮). It. Was. Excellent. So delicious. Thin strands of tofu noodle are tossed with chili, carrot, and cilantro stems, dressed in chili and sesame oil. Light, fresh, flavorful, a little spicy, with small bursts of cilantro freshness." 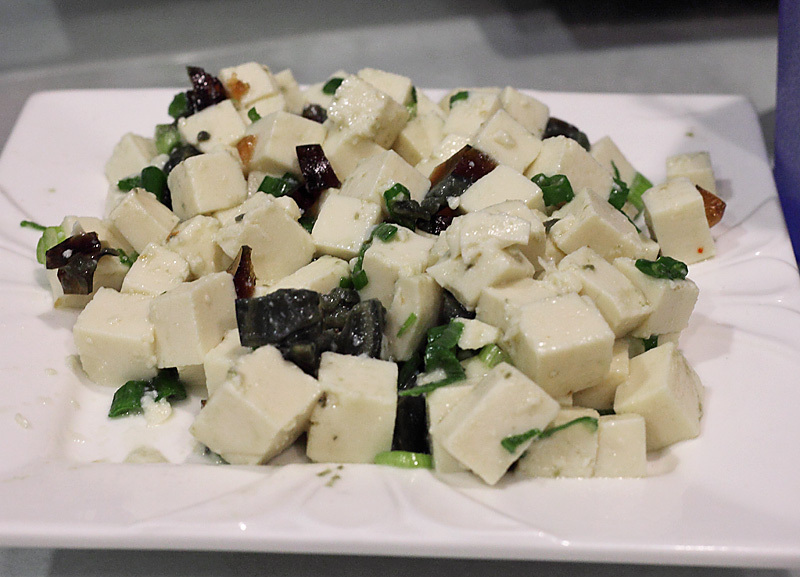 ReneG: "Tofu with preserved egg also showed off the kitchen's fine ability to balance strong flavors. High on my list to re-order." boudreaulicious on the pork and sour cabbage soup: "It was terrific! The spongy pieces were actually "frozen" tofu which floated on the top. Beneath the tofu were gorgeous wide slices of bacon and the greens, which were, essentially, sauerkraut. Flecks of cumin and caraway completed the dish. This was one hell of a Polish-Chinese mash-up!!" cilantro: "I've had several outstanding meals at Homestyle Taste. The hot pot (we chose fish) was a real standout. Be sure to get the fried dough as one of the ingredients." AlekH: " [red chili] tendon - thinly shaved and lightly slicked in chili oil. Going back and forth between this and the tofu was a great contrast in textures and a perfect way to start a meal." BR: "There may not have been anything particularly special about the shredded pork with special chili sauce, but it was absolutely delicious and just so comforting. This is the type of dish you dream about on a cold, snowy Chicago night." laikom: "The place appears to be run by an extremely cheerful and loving family. The proprietor (mom?) had a huge grin plastered across her face the entire time we were there, almost to an absurd level. The atmosphere was very laid back, the staff in sweat pants, everybody seemed as if they were doing what they love to do. Despite the laid back atmosphere service was attentive, plate changes being offered 3 times, each time a tag team of staff placing the new plate as soon as the previous one was removed. Different staff members checked with us throughout the meal to make sure we were enjoying the taste of everything. We were the only non-asian table in the place, but we were treated like family." TKent: "Finally, a shoutout to the waitstaff/ownership, who were fantastic to us throughout the meal, recommending to us dishes very typical of the region. It feels like the Bridgeport Chinese restaurants are more hospitable than the ones in Chinatown- partially because they don't have to worry about as much turnover, but probably also due to the fact that they need to work a bit harder to ensure returning customers." So happy to see this nomination--two of my very favorite meals this year!! GNR for sure!! This is one of those places with a nice roster of must haves but you just know there are gems buried in that menu. This place has a number of awesome and unique dishes, like the iron pot selections, most recently i had the lamb soup which was so rich with marrow, it was like a superior lamby version of the korean soup Sul Long Tang. They have my favorite renditions of classics Donbei dishes, such as the bone in cumin lamb, and the smoked pork pancakes. It's the kind of place with so many favorite dishes, that it's difficult to eat there without at least 10 people. Even then it's difficult to explore more of the menu, because I crave the favorites so much. Had a wonderful meal here last pm. Brought a group of friends some more adventursome than others ("sorry, i don't like tofu and I've got to have crab Rangoon") but by night's end, all were on board bigtime. One insisted on sharing a couple Jamaican places on the far south side to repay the gift he felt I'd bestowed. Can hardly wait to try them. In the meantime, yes it is a GNR. I had some carryout from Homestyle this week and want to compliment that the cuisine travels well: wonderful cabbage and tofu skin noodles and the rich colorful wide noodles (packed separately from the crisp vegetable toppings) stayed ice-cold below a piece of cardboard on which some best-of-breed sweet and sour chicken and very decent smoked pork roll (I do prefer Lao Beijing's slightly for better balance and complex smokiness) were steaming. Portion sizes were remarkably generous. I dig what they're doing and support the nomination even with similar options nearby, an embarrassment of riches.